The Infradry Compact is a new high performance infra-red (IR) dryer module for a wide range of water-based inks and coatings from Heraeus Noblelight. It combines high power density infra-red heating with controlled air introduction and extraction to provide effective and efficient drying. The heat to dry the inks or colors provided by powerful twin tube IR emitters. These can be of wavelengths from near infrared to medium wave, depending on the specific application. NIR emitters operate at a surface temperature of 2600°C for very rapid, intense drying, while medium wave emitters have a surface temperature of 900°C and offer the most efficient mechanism for the removal of water from a product surface. To remove the heat and water vapour from the inside of the module, the Infradry Compact features a specially developed air duct, which feeds an evenly distributed air flow into the module’s drying area, either by internal or external fans. This air is heated by the IR emitters, absorbs the evaporated moisture and then removes it from the drying zone. This prevents saturation of the atmosphere inside the module and also precludes leakage of hot air to surrounding, heat-sensitive machine components. With its very high power density and its extremely efficient reflectors, which concentrate the IR onto the substrate surface, the new Infradry Compact offers very high drying performance. Its compact, modular design and plug-and-play installation allows easy retrofit and it is configurable with a wide range of interfaces, including Profi-Net and RS485. Lamp replacement is quick and easy through a slide-in drawer and an integral pyrometer and stepless power regulation ensure precise control of drying operations. 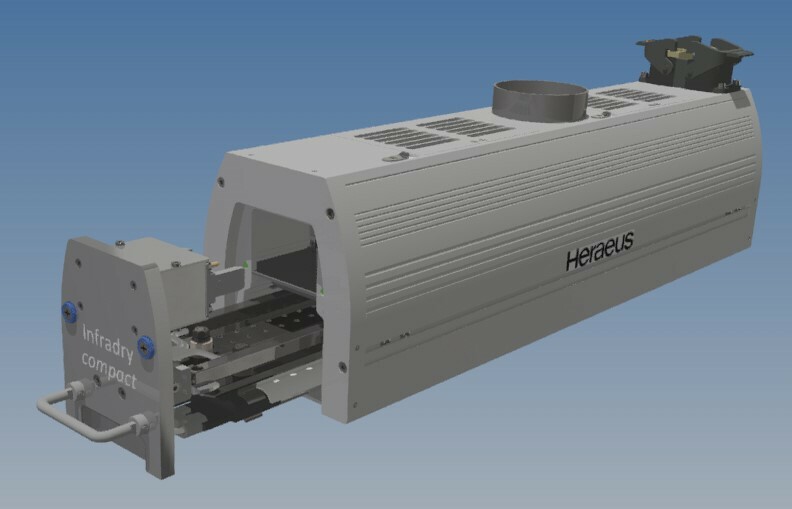 Heraeus specialises in the production and application of high quality light sources covering the electro-magnetic spectrum from ultraviolet to infra-red. It has over 40 years experience in infra-red technology and offers the expertise, products and systems to provide efficient and effective solutions to drying, heating and curing problems throughout industry.